BELLEVILLE – The Yardmen Arena was the place to be on Monday, as couples, families, and friends gathered together to spend their Family Day watching the Belleville Senators play the Utica Comets. 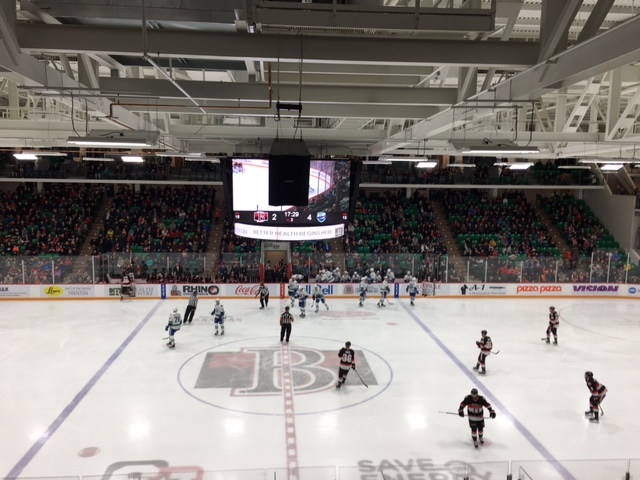 As the team approaches the three-quarter mark of the season, the Belleville Senators have played twenty-seven home games, and sold out six of them. But despite that statistic, the fans QNetNews interviewed have thoroughly enjoyed having hockey back in the city. Derrick Mularchek, a fan who says he has been to half of Belleville’s home games this season, said he has enjoyed watching the Senators more than he enjoyed watching the former Belleville Bulls of the OHL. Kim Murphy, says her favourite B-Sen is captain Mike Blunden. She says she also enjoys watching the Senators more than she enjoyed the Bulls. Even the players recognize what their presence brings to the city. B-Sens forward Ben Sexton was awarded the first star of the game for netting his first ever pro hat-trick. Sexton has missed some time due to injury this season, but says he has greatly enjoyed playing in front of the fans when he’s had the chance. Fans also think that having an AHL team has been a great thing for the growth of the cities economy. “I think it’s great. I work with economic development so it gets Belleville’s name out across Canada and the U.S. so I think that time when we weren’t in the news, I think there (was) a loss to the city not having Belleville’s name mentioned all over the place when they mention the sports,” said Mike Hewitt, a fan who has been to three games so far this season. Ryan Langille, who visited the Yardmen for the first time on Monday, said although it was his first time watching the senators live, he always listens to the games on the radio to show his support. He said he knows having a local hockey team is a positive thing for the people of Belleville. Murphy said having an AHL team is great for bringing the community together. “It means everything. There’s so much more community spirit now, it’s so nice getting out to the games. It’s great,” she said. Coach Kurt Kleinendorst has only lived in Belleville for a short time like the rest of the team, but says the team is a great fit within the community. “I think they’re great. This is a good fit, I know we’re kind of in the Maple Leafs area, but over time what you’ll find is the younger fans will be senators fans, and the mommy’s and the daddies will probably stick with the Leafs fans, but overall it’s a great atmosphere. And they’re very smart, they’re educated, that’s the one thing that I’ve learned. I’ve had conversations with some of the fans, and they know their hockey. It’s been a good fit for us.